Autodesk and Trimble have entered into an interoperability agreement aimed at saving customers time and reducing project costs typically associated with workflow inefficiency across different suppliers’ technologies. This will benefit architects, engineers and contractors, and importantly, project owners by enabling more freedom to optimise technology workflows needed to meet the complex requirements of today’s construction projects. Autodesk and Trimble have a shared goal of meeting the evolving needs of the building and infrastructure industries. Reliable, fluent exchange of information among multiple stakeholders and platforms is essential to this end. The Trimble and Autodesk collaboration demonstrates their ongoing commitment to support open industry standards such as Industry Foundation Classes (IFC) and Construction Operations Building Information Exchange (COBie), and can enable current and prospective Autodesk and Trimble customers working on the same projects to work together seamlessly through optimised file compatibility across applications. Autodesk announced several key new and enhanced features for its flagship Revit software designed to increase software performance and help users better model and communicate design intent. Available starting April 18, 2016, Autodesk Revit 2017 software is the latest version of its software purpose-built for BIM offering an all-in-one solution for architectural, MEP and structural engineering,and construction professionals. Enhancements in Revit 2017 will help drive more efficient processes within an extended, multi-discipline Building Information Modelling [BIM] workflow. Work faster: Fasten your seat belt – Revit 2017 is the fastest and best-performing release yet. New behind-the-scenes optimizations and improvements to more than 100 functions help the software keep up with the most demanding users, even as they work with large, complex models. More operations running with multi-threaded capabilities improve overall software performance by as much as 20%. 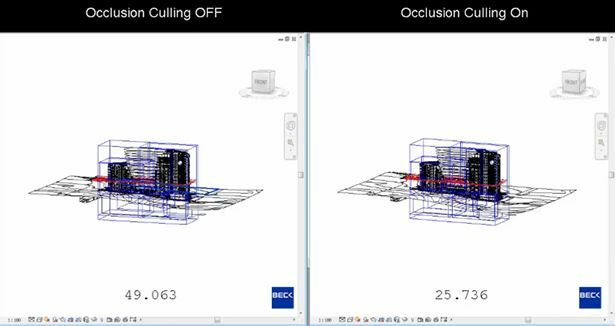 Revit 2017 also works faster by displaying only the visible elements of a view and not drawing elements that are hidden.The result of this occlusion culling is view refresh and user navigation that is up to 4.5 times faster than before. 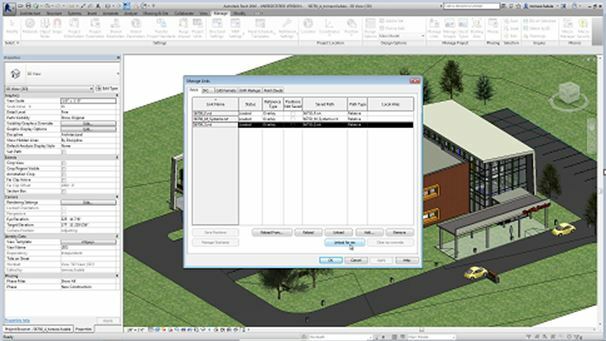 Revit 2017 features improve view refresh and navigation performance. Image courtesy of Autodesk. With multiple improvements and user-requested updates that simply help make features easier to use,Revit 2017 further contributes to user productivity. Revit expert, author and trainer Paul Aubin experienced this running Revit 2017 for more than six days straight commented. “At the end of the week I realized, wow I never had to restart, and I fully suspect it would have kept running”. Revit 2017 gives users tools to create models that even more accurately and completely represent what will ultimately be built, connecting design and fabrication workflows. The Global Parameters feature helps encode and capture design intent within a model by enabling users to define relationships between building elements and to use parameters to drive dimensions and values across a project. With Revit 2017 designers can include the higher level of detail needed for downstream fabrication and building, modelling projects of any size and complexity. Mechanical detailers can automate the fabrication model layout and convert design level of detail model elements to fabrication level of detail elements. This helps contractors more quickly prepare a model for detailed coordination fabrication and installation. Structural engineers can improve the definition of design intent, or the level of detail for reinforcement modelling and documentation, to better connect steel design to detailing workflows. Convert design level of detail model elements to construction level of detail elements using the Design toFabrication tool. Image courtesy of Autodesk. Revit is at the core of effective BIM processes for many architects, engineers, and construction professionals, as well as owners and facility managers as they capture, document, and share project design data. Revit 2017 helps users to document a project’s details more effectively with the new WYSIWYG Text Editor and new options for text placement providing the text control they’ve been asking for. Communicate designs more effectively with new “what you see is what you get” editing and features that give youmore control over text. Image courtesy of Autodesk. Revit 2017 elevates communication capabilities in ways that help users to share data both within Revit and in extended BIM workflows. Data sharing within Revit 2017 has been improved with new tools that simplify the reuse of schedules. Data sharing within Revit 2017 has been improved with new tools that simplify the reuse of schedules. Image courtesy of Autodesk. When it comes to communicating design intent with compelling 3D visualizations, Revit 2017 makes it possible to add depth and pop to elevations and sections in either architecture or coordination views with the new Depth Cueing option. Add depth to elevations and sections to create stunning visuals that better communicate your design. Image courtesy of Autodesk. Render more quickly and accurately with Autodesk Raytracer rendering engine, the default visualization engine in Revit 2017. Featuring efficient settings, video card agnostic CPU operation, and excellent use of image-based lighting, Raytracer provides quick, more photo realistic results for architectural rendering. Render more quickly and accurately with Autodesk Raytracer, the default visualization engine in Revit 2017. Image courtesy of Autodesk. The classes cover a wide range of Autodesk products and solutions, and as such there will be something new for everyone. If you weren’t able to attend AU2015 in Vegas in person, it will be well worth catching up on any classes which take your interest. If you are getting the “No suitable geometry found…” error message when trying to export to NWC, there may be a number of causes. There are also various forum posts and an Autodesk solution page, where you can find more potential causes. In my case, none of these workarounds were applicable to the issue. When I turned off ALL categories via the Visibility/Graphics (VG) menu, I noticed there were still a number of elements which were visible. This shouldn’t be the case, as all elements in Revit are categorised under the categories listed in the VG menu, so therefore when you turn off all categories, you’d expect to see an empty screen. I then deleted these elements, turned all the categories back on and tried to re-export to NWC – finally, successfully. When I mentioned this to the consultant I was working with, he looked into it further and noticed that the ‘Profile’ category, which was a selectable option in Revit 2013 when creating an In-Place family, had been removed in Revit 2014. During the upgrade procedure, Revit had changed these ‘Profile’ category elements (which no longer exist in Revit 2014) into a category called ‘Other’, which is not a ‘properly defined’ category inside of Revit. Therefore, these ‘uncategorised’ elements were causing the NWC export to fail. The consultant was then able to re-model these elements under the ‘Wall’ category, and all was well again! BIM Campus is a training initiative brought to you by Spacegroup. On the back of the recent highly commended Skills Developer award from Dynamo North East, BIM Campus is back! Campus is a purpose made Building Information Modelling (BIM) training suite with pop-up sites across the UK, which aims at teaching and building usable and relevant BIM skills that are instantly transferable into the workplace that enable young people within the construction industry to make a valued contribution to their employer at a very early stage. We are currently offering not in education, employment or training (NEET) 19-24 year olds a FREE 6 week intensive introduction to BIM training course covering all essential aspects of BIM. 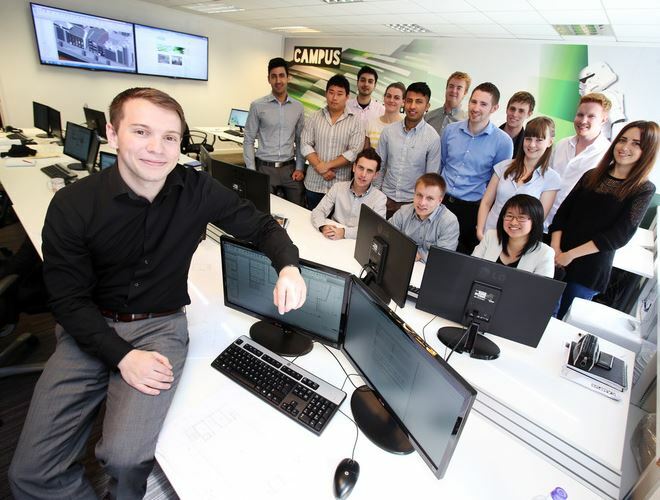 Aside from the training provided by Autodesk certified expert Dayle Zieleniewski, BIM Campus have linked up with some of the UK’s largest and most influential AEC companies, to offer world class knowledge transfer to all students. Some of the companies currently signed up include: BIM Store, Autodesk, Leica, NBS, Faro, BIM Technologies, Space Architects, Solibri and many more. The training is offered free of charge for all graduates ages 21-24 who are not currently in employment. Check out the list of past alumni here, including the employment opportunities which have come their way on the back of this course. Former trainer Peter Morton with a group of past alumni in the purpose built Newcastle campus. Orbit, pan and zoom more quickly with the new Draw Visible Elements Only option. Image courtesy of Autodesk. Embed design intent in a model by using project-wide parameters to drive dimension and element instance parameters with the Global Parameters feature. A global parameter can measure dimensions and calculate formulas to drive dimensions and parameter values in other elements in the project. instance parameters with the Global Parameters feature. Image courtesy of Autodesk. With Family Visibility Preview, get a better view of design intent by filtering out geometries that are not viewed. Work more quickly by previewing geometries and making adjustments before loading a Family into a project. 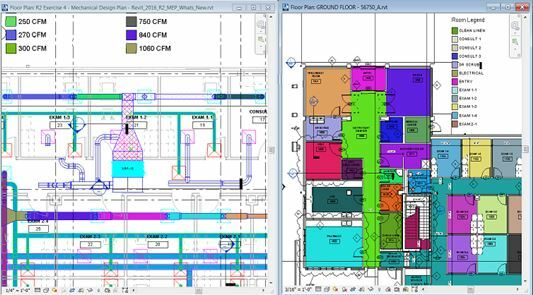 As an incremental install, Revit R2 can be less disruptive for users and administrators by spacing out changes vs. incorporating larger annual updates. Any downtime or disruption to work processes can be more easily out-weighed by the gains in performance, usability and stability. Latest update to Autodesk InfraWorks 360 brings a more integrated approach between design and analysis. Roadway design can be a highly iterative process with designers having to balance multiple factors – the demands of geographic and financial constraints, compliance with geometric guidelines, management of safety, as well as providing suitable capacity for vehicles. 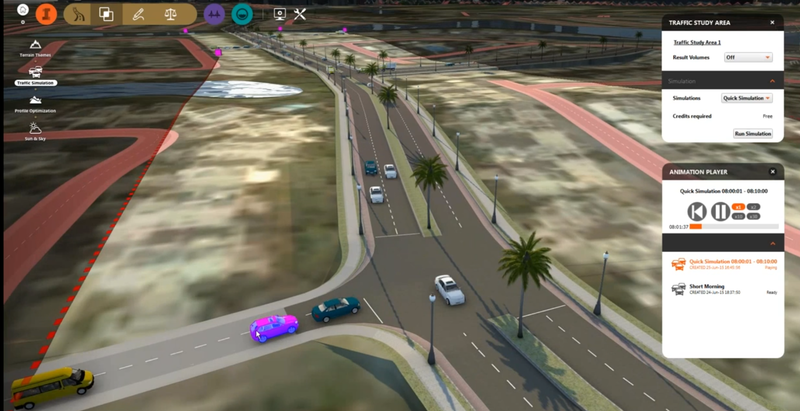 The traffic simulation and analysis capabilities included in the latest update to Autodesk InfraWorks 360 brings us closer to a position where all of these considerations can be addressed in a single intelligent, 3D model, drastically cutting the time required to gain approval from all internal parties on the final design. The addition of Traffic Simulation for InfraWorks 360 isn’t the only update. On the collaboration side, the ability to share models in read-only mode has been added to provide designers better control over their model data, as well as may other features for Road, Rail and Bridge design. Traffic Simulation The ability to run traffic simulation models has been available as an Autodesk Labs Preview for the past few months and has now graduated to become an official part of Roadway Design for InfraWorks 360. This addition gives the designer greater confidence in the roadway design that is passed to the traffic engineer for detailed analysis. Designers have full control over which roads are analyzed and have the ability to input traffic flow and mix, specify time of day (e.g. to model rush hour), define turn lanes and set up signalized intersections. It even works on roundabouts! With the ability to analyze and optimize as part of the design process, it is more likely to comply with capacity requirements so that designers won’t be going back and forth with the traffic engineers making numerous minor enhancements to the design. Rail Design: Designers can now create their own detailed rail styles allowing greater flexibility in defining the various structures along a rail track. This is especially useful for troughs at tunnel entrances, circular tunnels, viaducts, etc. 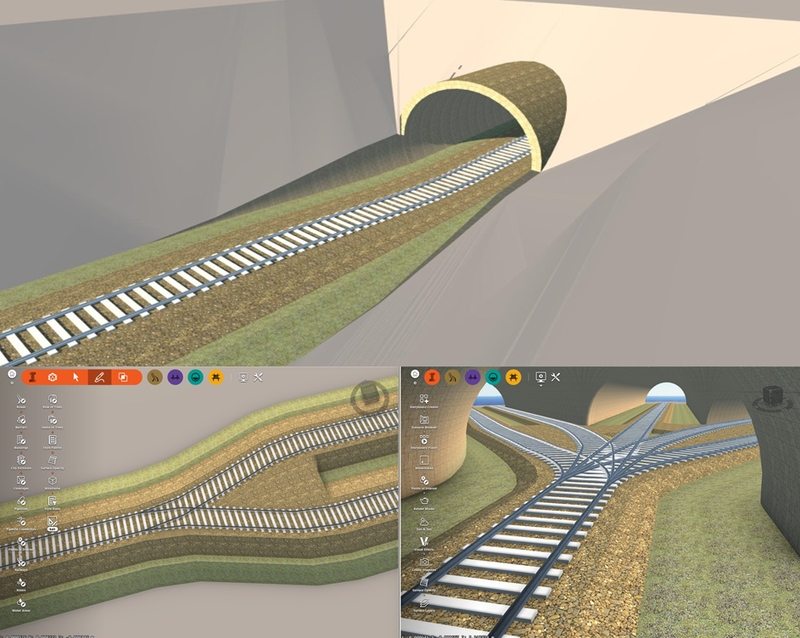 Rail features can also now be grouped together in InfraWorks 360. For example, when you have 2 rail tracks, you can create a single bridge to carry both tracks versus having to create a bridge for each track. You can also specify the length of transitions between rail styles. Road Design: The main enhancement for road designers in this update is the improved intersection modeling. The intersection editing tool can now be used for staggered intersections bringing greater flexibility to the design. Right-In, Right-Out intersections, and Left-In, Left-Out intersections can now be created simply. Roundabouts have also been updated to support both left and right hand drive roads and include standard based road markings and yield lines. Bridge Design: Piers and Foundations now have a library of alternative design styles which can be used to make models more realistic. These parts can be customized further in detail via the asset card. And if there are multiple components (piers, girders, etc.) any change to one of these can be quickly applied across the design to similar components. Model regeneration and quantity/volume calculations are now carried out only when required, reducing unnecessary model regeneration, significantly improving performance. The grouping feature in InfraWorks 360 allows a designer to use a single bridge to carry multiple tracks versus having to create a bridge for each track. 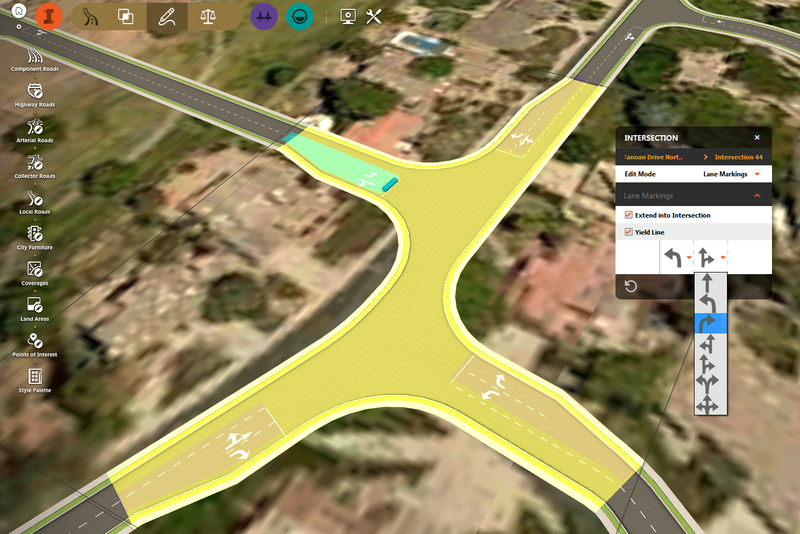 Intersection design enhancements in InfraWorks 360 bring greater flexibility to created more complex designs such as staggered intersections. For more details on all the ways that the latest update of InfraWorks 360 can help improve the design of complete civil engineering projects, read Mark Burgess’ blog post on BIM on the Rocks. PAS 1192-2 and BS1192:2007 are 2 key documents in the UK’s Level 2 BIM Framework. They are currently both undergoing an update and are under consultation. This means that you get a chance to help shape the future of the industry with your suggestions. Remember, there’s no point complaining about how things work if you haven’t attempted to make them better yourself! 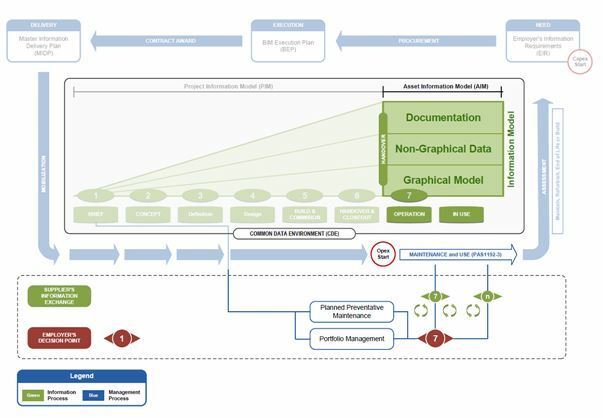 Two key documents at the heart of BIM Level 2, PAS 1192-2 and BS1192:2007, are being revised by BSI with the proposals available for comment until the end of August. The PAS 1192-2 Specification for information management for the capital/delivery phase of construction projects using building information modelling is available here – and the BS1192:2007 Collaborative production of architectural, engineering and construction information – Code of practices available here. PAS 1192-2 was originally released in 2013, while BS1192 was last updated in 2008. Both documents are being revised to update out-of-date wording and reduce conflicts between the two standards. When running checks in Solibri Model Checker (SMC), you should feel confident that your rulesets are actually checking the correct components for their requirements. The Results View lists components in the model that fail a check, but at some point you will find yourself interested in what the components are that are checked in the first place. The Checked Components View lists what components have been checked, passed, and failed and thereby isolates those components in the 3DView. In addition, as you review your results of a check, you can use CheckComponents to isolate components in the model based on the results of issues being accepted, rejected, or undefined. You can follow along with the examples in this article by opening the SMC Building.smc file that comes with SMC. Yesterday saw the release of Autodesk Stingray, an immersive real-time visualisation platform. Autodesk have now revealed details of Project Expo – This seems like it is built on top of Stingray, to provide real time visualisation, in the cloud! Project Expo was released yesterday via the Autodesk Labs, it is a confidential beta, so although you can use it, you can’t talk about it – a bit like Fight Club! We’d love to hear from Architects, who want to fit immersive visualization into their design process, to find out how we can make this technology better. We plan to keep improving it for the duration of the Technology Preview. You can reach us at labs.expo@autodesk.com or in the discussion forums available to participants on the project. So, what are you waiting for? Sign up today via Autodesk Labs and try out this new technology preview before your friends and colleagues get a chance. You could also help shape the future of the products with your feedback. Today, at the Game Developers Conference (GDC) Europe 2015, Autodesk announced the release of Stingray, a real-time engine that can be used to create high quality 3D games, or be applied in the AEC industry to make BIM-informed 3D visualizations in 3ds Max fully interactive in a real-time environment. It means going anywhere in the model and seeing everything as you would in the physical world. The Stingray engine is built on the powerful, data-driven architecture of the Bitsquid engine, which Autodesk acquired last summer. The new Stingray engine has profound implications for building designers, as it creates connected workflows with Autodesk 3D animation software like 3ds Max, which already supports a BIM process. The Stingray engine features a live link ability with the latest version of 3ds Max, which makes it possible to have changes made in 3ds Max happen immediately in the Stingray engine. To understand the impact of this new capability within 3ds Max, let’s take a look at the state of a BIM workflow using Autodesk solutions before today’s announcement. As a powerful real-time rendering engine, Stingray will help power Autodesk’s vision for connected visualization within a BIM process. The abilities that Stingray offers are the first step towards a connected future where software like Revit, 3ds Max and 3D environments like the Stingray engine, work seamlessly together to allow users to truly understand a design. By allowing real-time control, design changes and challenges may be quickly communicated in a compelling, visual way. For more about the Stingray engine and how it is fueling a new design process for AEC professionals, visit http://autodesklivedesign.com. Be sure to also check out this video and podcast with Angi Izzi, Senior Strategy Manager for Architecture, Autodesk and Rick Davis, Design Visualization Industry Manager, Autodesk. Stingray is expected to be available as a desktop subscription download starting August 19. For more about Stingray, including availability and subscription pricing information, visit http://www.autodesk.com/stingray. As you all may have noticed, Revit 2016 has now been released, but what new features do we all have to play with? Rob Clark from Excitech posted the following videos explaining what’s new in Revit Architecture, Revit Structure, Revit MEP & AutoCAD Civil 3D 2016. BIMopedia brings you the latest news and reviews from the BIM world. Check out BIM Diary for all upcoming events and webinars. You will find the latest BIM standards and protocols under BIM Documents.